A Fairy Tale of sorts. I believe there are a lot of my “sisters” who are over 70 who could write this slight fantasy also. 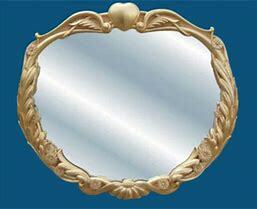 However, being in my 80’s I owe it to myself to mention this mirror first. I needed a hair cut, not styled, just trimmed. I wait usually two months before making an appointment. As I walk-in the receptionist remarked “I Remember the face Mam, but not your name-?” Probably because I do not like being out of my own comfort zone. Now, to get to the Magic Mirror part. Got my hair washed, using white hair shampoo. Then cut,blowing it dry, a little tease all this done with my back towards the mirror. “Well, all done” as she turned the chair for me to approve her work. I can honestly say I was pleased! I looked good.! Maybe even younger. It had to be magic! When I got home I wanted to take a selfie and send it to my adult children. My new haircut. My IPhone is ready for me to take my"selfie" . Well, it turned out that I looked like an old lady 👵🏼 ... me! No change, same face. Hair did not do anything different. Very disappointed! Really, I believe they spray an age reducer on those mirrors for us oldies. I say this because my bathroom mirror never lies either do selfie ‘s. Its the real me. look in their Magic Mirror. Got a facial after all and same face! Summer is not my favorite season. It was when I was school age being the end of the school year and fun time in the neighborhood. Now. at this age I'm at I find the weather too hot for playing outside with the neighbors. In fact, no one is outside in this neighborhood of reitrees, too hot! Do enjoy the flowers and trees in bloom all summer but maybe I am a little weird for the next season I love to see the colors in the leaves as they start to change in the trees and fall into a pile on the ground likes pretty skirts of color. SNOW, which I am sure a lot of Northern friends find trouble with but here I only see snow laying on the branches like decorations or a 2 inch cover on the sidewalk. This is in Eastern Tennessee I am at. I was thinking that since I was born the end of September, that may be a reason I love Autumn or Fall (call it either). Now for me, I am a bit of a recluse. I love my home and most of my "doings" are either at my crafting or writing. I even prefer to write letters than telephone. Age has a few limitations also for me at least and I envy those that get up an go. Having the ablity to FACETIME my five adult kids and their kids is a blessing since we all live in different places. So for us older folks having an IPAD or IPHone and not being afraid to use it can be a plus for us. My feelings regarding Iphones for the much younger set and how they use it is a little different though. during the HOT summer days and keep hoping for Autumn or Fall to arrive, then my Winter and hopefully it begins all over again as Spring. Took a trip to Florida for three weeks to visit my friends,my son, my sister-in-law and my two lovely daughters. It was a whir-wind with our RV in tow. Finally resting in Lutz Florida to await Thanksgiving Celebration. 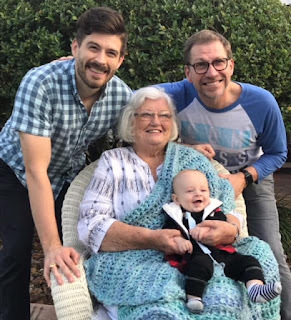 It was a lovely, delicious Thanksgiving at my sweet daughter Valerie's home with a visit for the first time from my new Great-grandson "Tripp". His mother and father from Texas and my son and daughter-in-law Jennifer Rothschild. Had the luck of my grandson from college there too, Connor. What a wonderful visit all day on Friday. 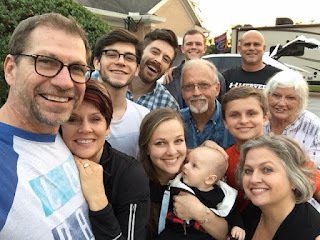 I am showing a photo of all of us which includes grandson Matt, grandson Jag, son-in-law Robbie. Did I miss anyone? Yes, son and daughter-in-law David and wife Hilda from Louisiana and daughter Cindi from Pensacola. 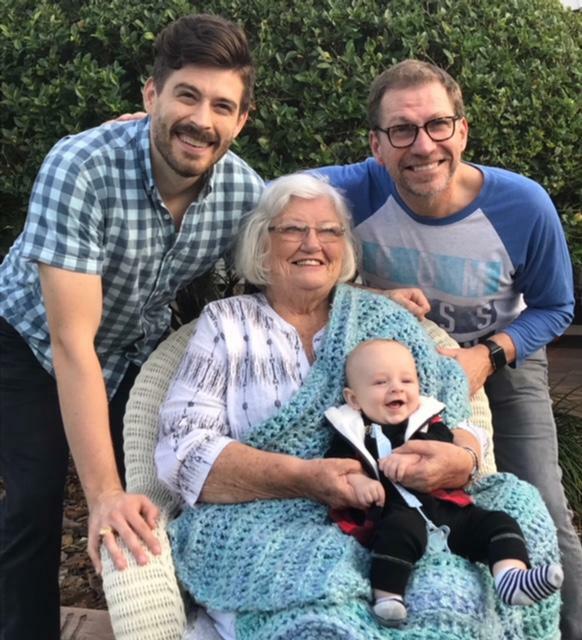 There were four generations together for first time and I fully enjoyed being the "Queen Mother" as shown in photo also. I had tears of joy when they arrived and tear of sadness to "Tripp" leave. Family minus a few not able to join us, but missed. The next day we started for home in Tennessee. The traffic was horrendous for those traveling North to South but our South to North was a breeze and watching along the Interstate the trees changing color the nearer we got to our destination. You see, Autumn and Winter, I love these seasons, with Spring coming in as third. We were glad to be home! Be it ever so humble. This has been awfully hot for East Tennessee this year but has just started to let up this week but still too hot. This of course, has led me to stay inside air-conditioning or fans about but even so being cooled I found myself to be lazy and my thinking shut down as far as crafting or writing goes. However, to try to keep my brain alert I started doing puzzles. First on my IPhone but then and now with puzzles done at the table. I started with a 1000 piece puzzles titled The 1980's. Wow! Never again, it took me forever. 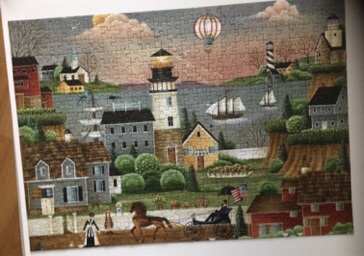 My dear husband tried to help and we finally got it finished with one piece missing. Get that! 1 ONE piece missing. I called the manufacturer who said he was sorry and would send another. I said "Not the same one please, not 1000 pc." I picked out of their catalogue a 450 piece and it went nicely and took about a week to complete, maybe 10 hrs. 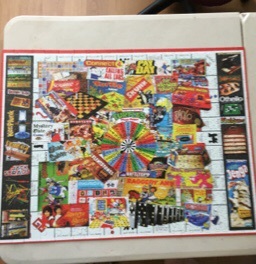 Then another one for 300 pcs, a breeze but not challenging enough so now we are doing a 500 piece old time photo puzzle. This one taking longer even with the help of dear husband. Being retired and hot outside this gave us something to do other than cleaning the house. YAY! We are hooked! My memories started to flow back also. I remember my parents having a cardboard table set up and a puzzle on it all the time. See, I forgot about that until we finished our puzzles. It must bring alive nostalgic moments. If only it could help my literary sense. One exciting thing! I became a Great Grandma to a beautiful (we all say that) baby boy. His name if Phillip Clayton Rothschild III. That's because my son is the first, his son the second with same name. I suggested, at least I think it was me, when they sent me a video to tell me they were preggie I suggested that they think of calling him by TRIPP. Triple Phillips for the P and Trip for triple. Aren't I creative? At least I hope it was my creativeness. If it wasn't my idea I am sorry but I am getting older by the minute as I either said it to them or heard it from them. I just love this little guy and I hope I am allowed to live to see him at the very least go to first grade. Now, I haven't blogged in awhile so here it is. Hopefully the next blog with be about rving in our camper to some interesting place. WELCOME FALL!!! I MEAN AUTUMN . I would like to be 40 and know what I know at 80+. you could see the changes as they age, you just don't believe it happens to you. may have passed and there are those parents who need care. You just don't see that in your head happening to you. Then unexpectedly as you get to be 70 you noticed a difference in your thinking, walking or your desires. At least I did at 70. I started seeing a doctor more as Medicare creeped in at 65.
had no answer because she was not there yet. still quite a few of us around. I would like to be 40 and know what I know what I do at 80+. where you could see the changes as they age, you just don't believe it will happen to you. may have passed and there are those parents who need care. It’s not something you dwell on at that age. I like to collect. I have done that for 30 yrs. I collect all kinds of things that I finally sold (thank you eBay), as our circumstances changed. Once again I began a new phase of collecting, that of which I picture below. Now I look around at what seems like dust collectors. my trinket boxes and my glass balls. Put away I mean, boxed up and labeled for the "whatever". Into the garage they went. No, I don’t consider myself as a hoarder, just have an eye for lovely things. I still have to deal with my miniature tea sets, pie birds, Harmony House collection, and Cats Meow's each set holding a memory for me. pocket birds. Almost forgot to list those because they will always stay. I hate dust!! I hate the fact that I have arthritis! Both intersect with each other as my arthritis of aging makes it difficult dusting. When collecting years ago I never thought about upkeep of collecting things. So, let those who are in their 30's or more know what it is like to be 80 plus from me. Be thoughtful of that body as it will reach a time when “ things” occur to it. Now in my 80's I spend time watching my birds at a bird feeder while I sit, meditate and wonder "what's next". To me became dust collectors. Dust, I do not like to collect. These collectibles, which use to give me pleasure to look for and "collect", still some give me pleasure in my home. my trinket boxes and my glass balls. Put away I mean, boxed up and labeled for the "whatever". Sent to garage for a vacation. I also have my breakfast room, called a Bird Room, filled with wall pocket birds. Almost forgot to list those because they will always stay. When collecting years before I never thought about upkeep of collecting. Maybe hiring a cleaning lady a good idea? Need to tell you all about my New Year's Eve. I bet a lot of you had a wonderful time watching New York drop the ball. Well, I was in bed. My granddaughter decided to get married on New Years Eve so her " to be husband", now a husband, would never forget their anniversary. However, most of my family lived out of D.C. and had to fly in from Florida, Missouri, Louisiana and DH and I drove with our dog Katie from Tennessee and we were all worried about flight changes, snow etc. but it worked out well and we all got there. We stayed at a lovely hotel and used Uber (first time) for going places except my daughter, mother o the bride, made sure we had things to do. She hired a trolley to take us to and fro the Victorian house that grand got married in and buses to take over 100 attendees back and forth to their hotels. Parking and places hard to find and parking areas outrageous to pay for. Frugal Me! The wedding was lovely but I had to walk down the aisle limping in my gown as I am having knee problems. No big deal as they were all waiting for the bride. It was not your conventional wedding as her Dad past away a couple years back and she didn't want anyone else to take his place. No bridesmaid but her dog Harriett all decked out in a wreath of flowers walked in front of her to where the fireplace lit up with candles and her to be husband stood. Amazing how this dog knew she was to sit next to the bride and just look up at her and the groom the whole time. I think Harriet, the French bulldog, was an amazing idea and behaved so well. The reception was amazing as it was in the same Victorian house and each room had a different menu. You could have, vegetarian, Asian, American sliders, and two others I never got to. Then the eating area with tables dressed with candles and flowers filled the largest room in the house. Dancing and champagne tower I missed as I had enough of the DJ music. Going into a less inhabited room on the first floor where my DH decided to have a glass of wine in a quiet area for awhile. Then from 6:00 till 10:00 we knew our legs and feet had it so we took one of the bus shuttles back to the hotel. (which was like a new greyhound bus). Besides our little Katie (dog) was alone in the room and I felt sorry for her. We were in D.C. with all five of my children (adults) for those days plus a couple before to get makeup and hair done (not my idea), and to help if needed. New Years Day dear husband and I and Katie left for home. It was to me a great reunion with my five adult children which all together does not happen that often. Wanted A Lap Dog.....Got Her! to her, Happy Birthday Katie Dog. Upon my bed as I take a nap. this " Woman's best friend." 2015 Just in case you are keeping up with me.I will be 81 in September. ..I can't believe that I am that age except when I look in a mirror. My 5 children are grown of course and in turn have given me 9 grandchildren and 2 great grands. One granddaughter in law for now, until others make that step. I have been called by my grandchildren as Nema, Grandma, and Lollypop. I have given each child a song that I sang to them when they were newborn and one of the songs to a step-grandchild of 9 was LollyPop. "LollyPop ,oh! Lolly, Lolly Pop" and it stuck to me. Just as many lollypops have done in the previous years. I live with a husband of 40 yrs this past Dec. 2011 and a Boston Terrier of l6 yrs. and a cat Miss Kitty of 18 yrs. Both of my pets have now gone to animal heaven. So we were growing old togther. My precious Boston Terrier has passed last November 2008, devastated for 3 months DH got me a new pup,Katie, a 6 mn. boston terrier. She looks identical to her predesesor and gives us both trouble and happiness, she is now 3 yrs. old. More of Katie - Brr! Its getting cold outside. So glad to be alive, to be loved and to be fairly healthy at my age. I have no complaints, have a wonderful family of five married children, 9 grandchildren and 2 great grands. How could I not be satisfied. If interested, you can now send me a voice message. Check the right side of page and click on. If you like to write, being a story, a poem, an article, your thoughts for others to see blogging is the way to go. Being creative only since 2007 when I joined an internet group on yahoo and then a webiste for creative people on Swap-bot, this has been a way for me to write and create. There are a great many bloggers with many creative ideas and stories to tell and I wanted to join in so here I am and I hope lyou will enjoy my muse. I have gone thru a new phase in my life since 2007 and that is crafting. I did ATC's in all mediums and have started to think about quilting. I have done some fabric things. I have made fabric postcards in a yahoo group and did over 150 of them. Then fabric ATC's and they account for a few, but have two big looseleap books of paper ones I swapped with others. There are so many talented people and this is the way to find them. In 2009 I really go into making fabric journals, inchies, other dolls and the lapquilts for my grandchildren. It is 2012 and only one month left of this year. Still doing swap-bot challenges. I think I have sent out over 1200 postal packages, letters, cards, goodies to people by now and intend on sending more as long as the post office doesn't get more extreme than they are already. However, I did get the bug to write. I may not be great at it. I was a terrible in my English class at school. However, I love to write in journals, I make up nonsense stories to my grandchildren. Now I put all my writings down in a binder for my children and grandchilden can see what I did in my later lifetime. Even poetry has entered my thoughts as you can see on this blog. Swap-bot has become addictive for me. I love trading crafts and things with others. To see abilities of others as they send you things they make. Wonderful fun! Just go to http://www.swap-bot.com/ and see all the fun things you can share with others.